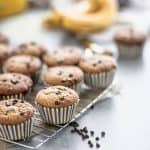 I think it is safe to say these Paleo Banana Muffins will become your new standard muffin recipe. They have become mine! Then a couple weeks ago, on one of these baking sprees, she used up all of my paleo chocolate chips and that’s when I lost my nut! And henceforth I started hiding things from her and the other muffin eaters. Now I am keeping the muffins in the basement freezer and the paleo chips behind the teapot in a stack of fancy serving bowls. Shh. 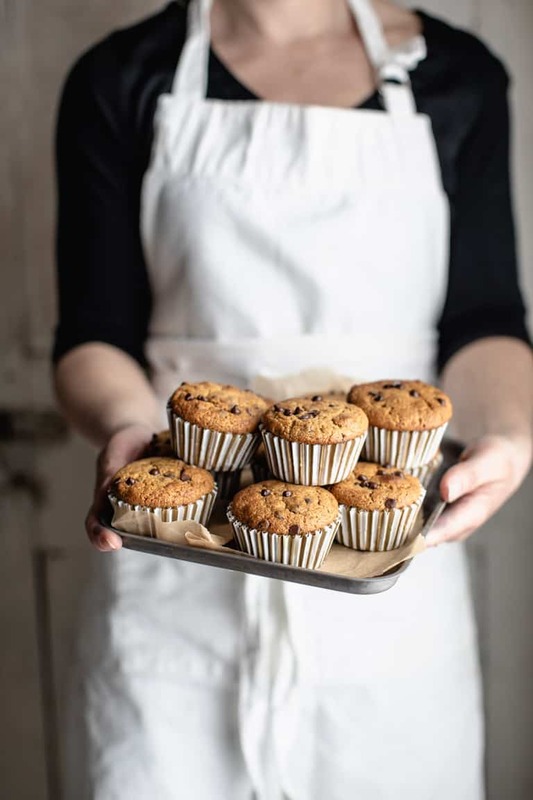 I’m just glad she doesn’t use recipes that call for arrowroot or almond flour, because then it really would be a crisis because I couldn’t make these banana muffins when I need them! Okay, mom of a tween rant over. 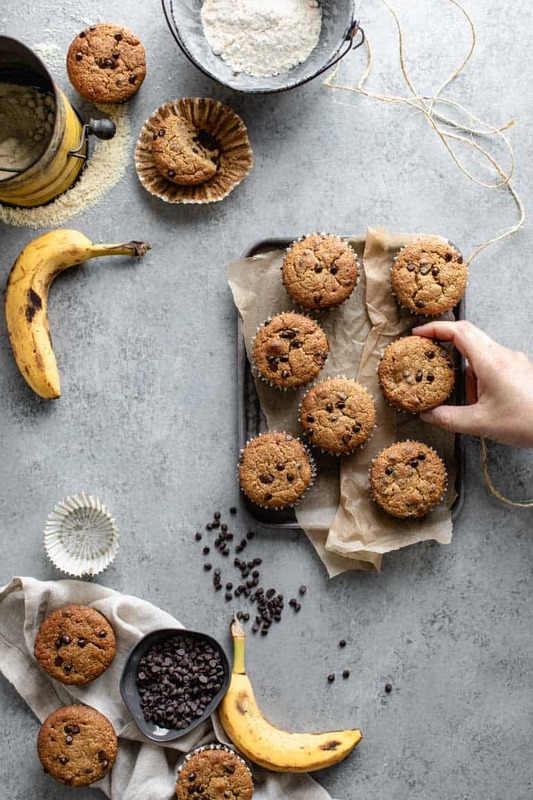 Let’s talk about these Paleo Banana Muffins my friends! First the wet ingredients (including the bananas) go straight into the blender. I love this method because there’s no mashing involved, but the blender actually whips air into the mixture so it helps to lighten the crumb of the muffin! Double win! Note if you do not have maple syrup, you can use honey or agave instead. If you’re looking for the best maple flavor, use dark. Then you’ll want to mix up your dry ingredients. The combination is mostly almond flour. I like the finely milled Bob’s Red Mill almond flour. (That’s an affiliate link.) If you want to take the time to sift it through a coarse sifter you can, but I don’t when I make these, and even though the batter looks lumpy the muffins finished aren’t affected. I did also test this with the natural flour and even with a blend of almond and hazelnut flour, but I think the fine almond flour gives the muffins the best texture. I added a little bit of coconut flour. I think it is helpful to add this to muffins because it helps to absorb some of the liquid, and adds natural sweetness. I found this helped keep the chips from sinking to the bottom of the muffins. A little goes a long way with coconut flour- only 3 tablespoons is necessary. Then add in the chocolate chips. I use the Enjoy Life mini chips (affiliate link) because it spreads the max chocolate taste out among the muffins. They are dairy free, but they are sweetened with cane sugar, so if you are strict paleo, you’ll have to chop up a paleo chocolate bar. I like to set aside some of the chips to dot on top. It doesn’t taste any different, but I love seeing them on top! These bake up to have a really lovely golden top. But they are not too dark, nor dry at all. Bake them in the center of the oven, and let them cool in the pan for 5 or 10 minutes before transferring them to a cooling rack. These are perfectly happy to be kept at room temp for three days. I think a little pop in the microwave to warm them up is very nice, but not necessary. Keep them covered. Just make sure they are completely cool before doing so, or the cover will trap moisture, and they will become wet. 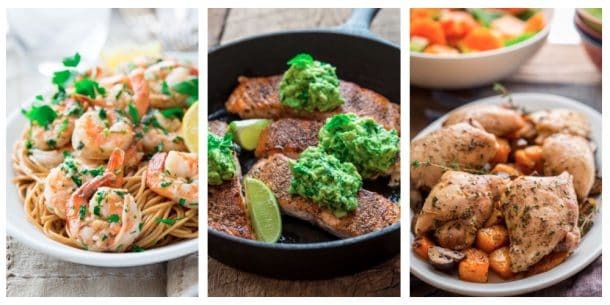 And you can always browse the 120+ paleo recipes in the archives right here. Thanks so much for reading. 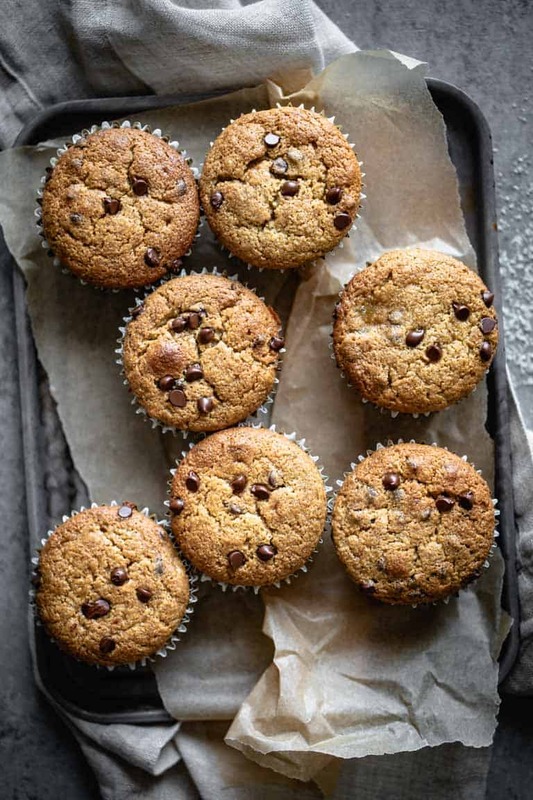 If you make these Paleo Banana Muffins, please make sure you come back by, rate and review. It is so helpful! I love banana muffins! These look so moist and delicious – perfect for the weekend. Thanks Natalie! I hope you loved them, and thank you for taking the time to comment and rate! They look fabulous and love the addition of chocolate. These have my name written all over them! They look so delicious and must happen soon! Thanks so much for the comment and rating! And these are so delicious- I hope you love them! What a great recipe! I have some bananas that are ready to be baked too! Perfect timing Sara! I hope you love it! Thanks so much for the rating and comment! These muffins sound fantastic. I love anything banana flavored especially filed with chocolate chips. 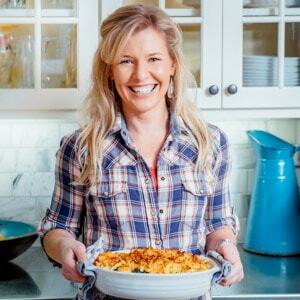 I will give this recipe a try. It’s so healthy and looks delicious! 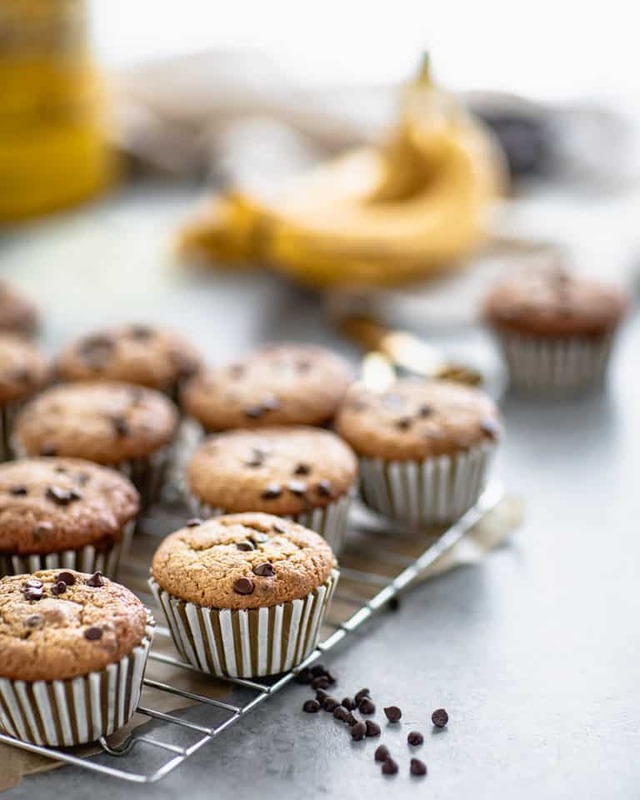 If you love banana, then you will love these muffins! Thanks so much for the rating and comment! Let me know what you think when you try them! Your photos are stunning and these muffins look like weekend brunching perfection! Thank you so much for the compliment and rating! I hope you enjoy these muffins with your brunch! Banana bread recipes are the perfect way to use up overripe bananas..which I seem to always have! And with such simple ingredients, these are the perfect after school snack, thank you! Such a fun breakfast – we have muffins every Thursday morning breakfast so we will have to try them! These muffins look so gorgeous and tasty! Such a delicious breakfast item. Such comfort food! 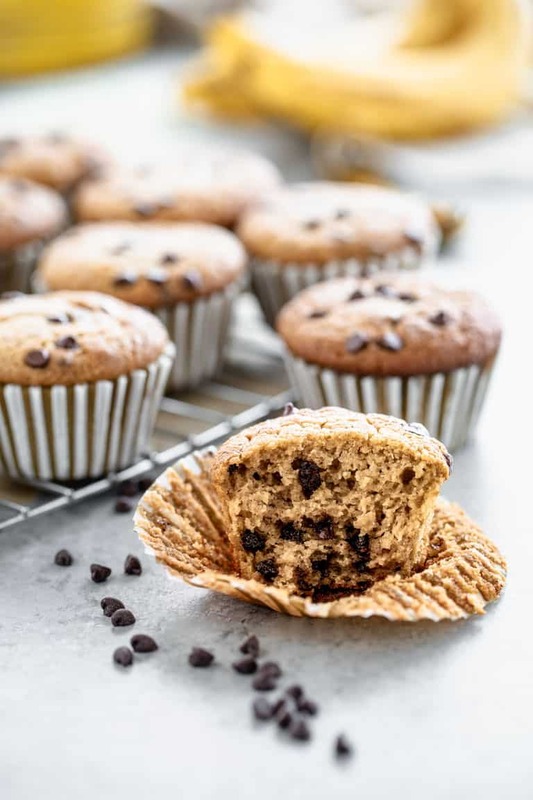 We all love muffins and banana bread, and I can’t help but be excited about the chocolate chips! Looking forward to making these! Ha! I totally get hiding ingredients. They ain’t cheap! And it would be a shame to not make these but they look So. Good. Is there anything better than banana in baked form? I don’t think so. Total crowd pleaser right here.